VERA LIONS PARTY IN THE PARK: Including a raffle being held in memory of Leo the Lion (inset). A PRIDE of Lion’s in the south of Spain is staging their second ‘Party in the Park’ this weekend and are promising a great day out for all the family. 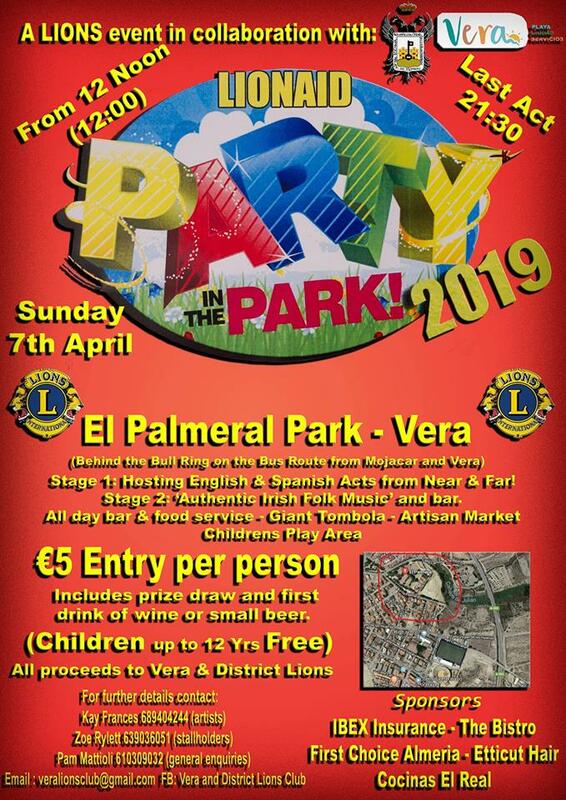 The Vera & District Lions Club in Almeria is busy preparing for their second event which is being held on Sunday, April at the El Palmeral park in Vera (behind the bullring) and are hoping to smash last year’s target and raise lots of monies for their local community. There will be a Lion Bar set up serving food and drinks and also a special Irish bar with live traditional music which was a great success last year. For the younger guests they will have bouncy castles, a fairground and entertainers. There will be a fantastic tombola and great prizes including a generous donation from a local business and raffle being held in memory of Leo the Lion. Gates open at 12 midday, with a €5 entry fee that includes a free drink and raffle entry and the last act will be performing at 8pm. Nikki said: “Again the local group of Lions has been overwhelmed by the fantastic support by local business and people offering time and prizes – without them this would not be possible.